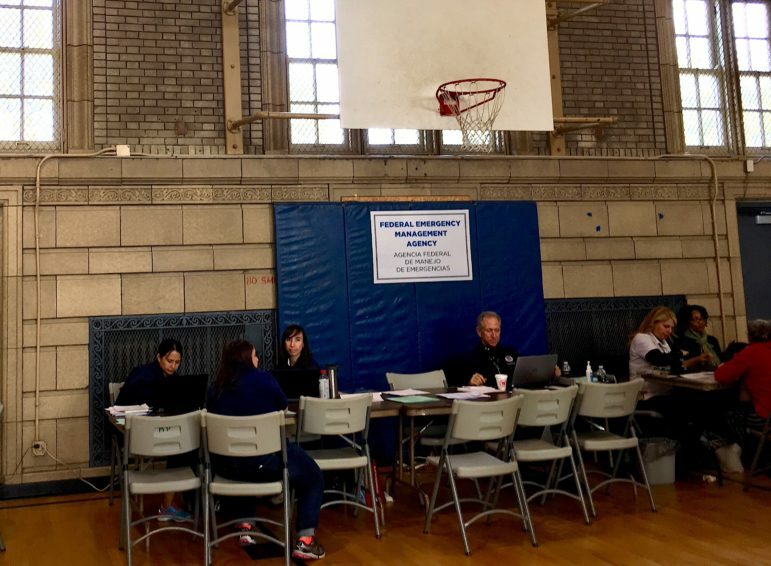 Service providers offer housing assistance and other aid at the hurricane relief center in the Humboldt Park field house. In the weeks and months after Hurricanes Irma and Maria struck last September, hundreds of Puerto Ricans fleeing the devastation on the island arrived in Chicago, already home to more than 100,000 Puerto Ricans, the largest such community in the Midwest. 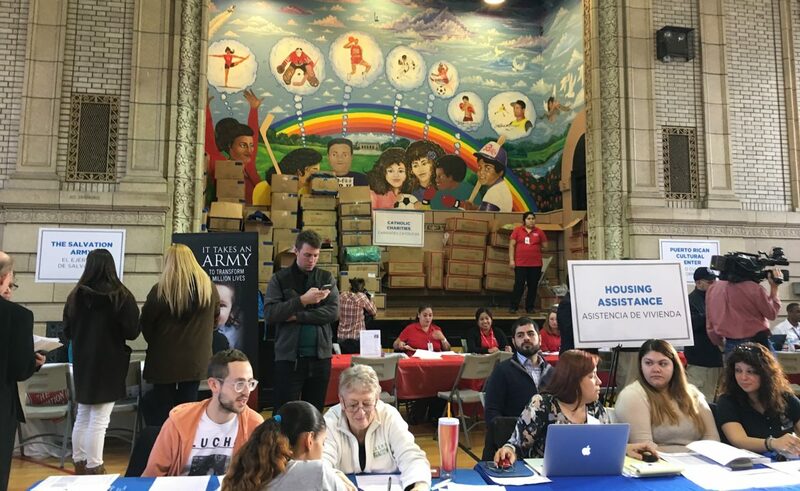 The evacuees streamed in to a welcoming center set up in a park field house by Puerto Rican activists, city officials and non-profit agencies in the Humboldt Park neighborhood. Still reeling from the shock and trauma of losing their homes and livelihoods in the storm, many felt desperate and anxious about where they would find housing, income and basic necessities in Chicago. The Federal Emergency Management Administration’s (FEMA’s) Transitional Shelter Assistance (TSA) program is meant to help in exactly these situations, providing immediate emergency housing for evacuees by paying for their stays in hotels. The program was originally scheduled to end on January 13, but it has been extended several times and is now available until June 30 for families already using the program who meet eligibility requirements. But none of this may have much of an impact in Chicago, as few evacuees have actually used the program. As of April, seven months after the hurricanes, a total of only 67 households had been put up in hotels through the TSA program in Illinois, according to FEMA data, which defines a household as single individual, couple or family. Critics point out the TSA program is poorly administered, poorly advertised and under-utilized in Illinois, squandering an option for safe housing that could have helped many more evacuees begin to recover and get back on their feet. Interviews with advocates and evacuees showed that many who could have used TSA assistance did not know about the program, had erroneous information about it or had heard about it but couldn’t find out how to get enrolled. Advocacy groups and community organizations in Chicago say there was — and still is — dire need for temporary shelter for evacuees in the city, which itself has a shortage of affordable housing. Unlike after most natural disasters, the need for temporary shelter in Chicago for many Puerto Ricans isn’t just a stopgap until they can return home, but the first stage in rebuilding new lives in a new city. That’s because the hurricane’s devastation came on top of the Island’s debt crisis and related deep cuts to government employment, schools and services, meaning that many evacuees don’t have jobs, electricity, adequate health care or education to return to even if their home is technically habitable. TSA appears to have been more effectively administered in other states. There are currently about 2,450 families who are checked into a TSA participating hotel in 31 states and Puerto Rico. Up to April, FEMA said it has spent more than $55 million nationwide reimbursing hotels for more than 7,000 TSA recipients as a result of of Hurricanes Irma, Harvey and Maria. But it did not provide an amount reimbursed to Illinois hotels. In response to a Freedom of Information Act request for such information, FEMA sent an incomplete spreadsheet showing $23,000 paid to four Illinois hotels to accommodate 14 households. FEMA spokesman Daniel Llargues explained that after people apply for FEMA aid, if they are found eligible for TSA they are notified by a phone call within 48 hours. Anyone who applies for FEMA aid is screened for TSA eligibility, which is typically granted if their home was made uninhabitable by the disaster and they have no other housing options. FEMA’s most recent Illinois data on total applications comes from late 2017, when 498 households were found eligible for TSA out of 643 who had applied for general assistance. FEMA said that TSA has been available for all evacuees in Illinois who are eligible and decided to use it, and that its representatives have contacted all who applied for aid and were found eligible. “It is completely up to the survivor on whether they choose to participate or not,” said a FEMA spokesperson. 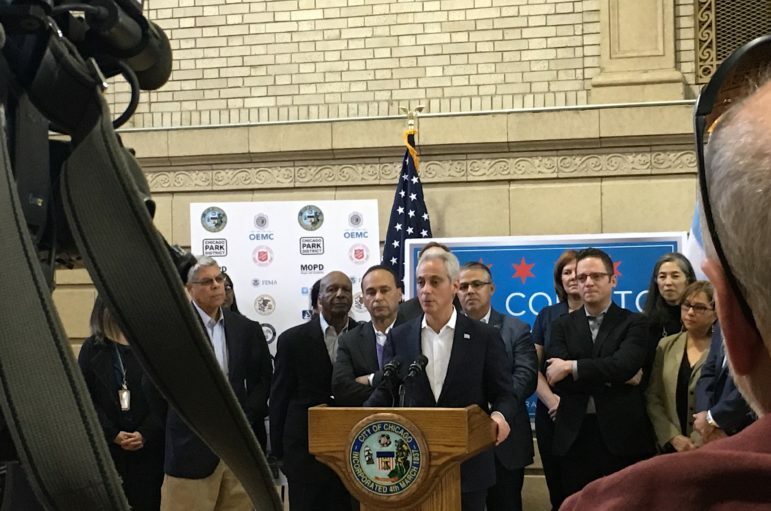 Chicago Mayor Rahm Emanuel speaks at a press conference at the hurricane relief center in the Humboldt Park field house. Also pictured (at left): 26th Ward Alderman Roberto Maldonado, Secretary of State Jesse White, Fourth District Representative Luis Gutierrez; (at right) First Ward Alderman “Proco” Joe Moreno. Roberto Maldonado is alderman of Chicago’s 26th ward, which includes the city’s main Puerto Rican neighborhood, Humboldt Park. He helped set up the hurricane relief center in the field house, which shut down May 1 but in the months immediately after Maria saw as many as 100 people a day. Here, housing agencies and other service providers offered assistance and guidance navigating the Chicago bureaucracy, and FEMA staffed a table where people could apply for federal aid that could include TSA assistance. Maldonado said that while he appreciates the individual FEMA employees’ efforts, he could tell from early on that the process would not go smoothly. “They make things so complicated,” he said. “It’s not user-friendly at all.” If an evacuee is approved for TSA, they are given a PIN and told to look through a database of participating hotels online to decide where they want to stay and book a reservation. Hotels elect to participate in the TSA program through a federal contractor called Corporate Lodging Consultants, which centralizes hotel availability for government business in general. In special cases FEMA may do outreach to get more hotels involved, but no additional outreach was done in Illinois. Alderman Maldonado can’t say for sure how many people have tried to use the program, but he says he can tell not enough are getting the help they need because of the “hundreds and hundreds” of Puerto Rican evacuees on the wait-list for subsidized housing managed by the Chicago Housing Authority. According to a CHA spokesperson, 105 evacuees have leased units and another 50 are in the screening process for housing via CHA’s Disaster Victims Waitlist, which gives families displaced by a natural disaster priority over others on the list. Representatives from FEMA staff a table at the hurricane relief center in the Humboldt Park field house. Some seem to have confused TSA with the housing program run by the city. For example when Grisel Santos, a 31-year-old optician, arrived in Chicago in October, she and her husband were eager to find housing for themselves and their young son as soon as possible. Santos had heard of the TSA program. But a woman from the church she had joined in Chicago, Rebaño Compañerismo Cristiano, told her that she would be put on a waiting list if she pursued that option. So she decided to abandon the idea, she said; with help from the church she and her family eventually found temporary housing on their own in suburban Cicero, Ill. In reality there is no waiting list for TSA if one is found eligible. Omar Torres-Kortright is the executive director of Segundo Ruiz Belvis Cultural Center, in Chicago’s Hermosa neighborhood. Three days after Hurricane Maria hit, the center hosted a benefit for the Puerto Rican Agenda advocacy group that raised more than $70,000 for hurricane relief. Their fundraising continues, but that initial sum was used to purchase emergency supplies — water, solar lanterns, batteries, and more — which were shipped to Puerto Rico on two planes donated by United in late September, one of which returned with 300 evacuees. In the following weeks the center’s staff found themselves serving as informal case workers for Puerto Ricans arriving in Chicago. But of the dozen or so families who went through the center, none used FEMA’s help to find temporary housing. Torres-Kortright says information about the TSA program, which was not announced until October 30, about five weeks after Hurricane Maria, was confusing and not relayed to the community in a timely fashion. “I know for a fact that I could have alleviated people’s situations significantly if the program had been announced earlier. I had people who needed this,” he said. If it was better-administered, he said, TSA could be “a huge resource. ” FEMA says “messaging” was sent by the National Business Emergency Operations Center in Washington, D.C. to the American Hotel and Lodging Association asking them to communicate and encourage participation into the TSA program. It is unclear how effective this was. For those needing housing who did understand and qualify for TSA, there were further obstacles. There have been relatively few and at times no hotels in the city of Chicago participating in the program, meaning that evacuees might have had to live in hotels in rural areas or suburbs far from the city’s Puerto Rican neighborhoods and the social services that they needed. Though the program has been extended three times, evacuees may have been discouraged by the previously scheduled end dates in January, March and May. Hotels can also enter and exit the program at any time, including if their seasonal rates rise during holidays or peak dates above the cap covered by TSA. So, it might not seem a stable option – even in the short term – for evacuees looking to enroll children in school or look for jobs. Cristina Pacione-Zayas, co-chair of the Puerto Rican Agenda, said the TSA program is just one indication of FEMA’s failure in Illinois. Pacione-Zayas said FEMA underestimated the dire situation of Puerto Ricans who arrived in Chicago. Many were denied aid, she said, because they couldn’t produce the documentation required to prove their case – a common problem after Hurricane Maria. Evacuees often don’t have verification, like a title to their home, due to the disaster. “How do you verify information if you come with nothing?” asked Pacione-Zayas, who said she helped multiple evacuees in this situation. The experience for evacuees who did participate in TSA in Illinois was in some cases positive. Unlike in New York City where the CPI revealed people being housed in shelters and marginal housing — such as one site identified on the TSA website as a bed and breakfast but appeared on investigation to be a daycare — the hotels available in Illinois are all major brand-name companies. Visits to several found comfortable conditions including free breakfast and sympathetic staff. Nilkia Roldán, 62, was living in Guaynabo when Maria hit and destroyed the roof and windows of her home. She said she had been promised aid from FEMA to fix the home in Puerto Rico, but it never materialized. She was unemployed, having lost her job at a gym when, she said, a younger woman was hired in her place. By November, still without electricity, she decided to move to Chicago, where a cousin lives. The rest of her family, including four sons and her elderly parents, stayed behind. When she arrived in Chicago, Roldán sought assistance at the Humboldt Park welcoming center, and she was told about TSA by a FEMA representative there. On November 7 she moved into the Sleep Inn on Chicago’s Southwest Side, near Midway Airport. She stayed there for more than three months, before moving to an apartment on the city’s West Side on February 14, 2018. Roldán says her experience with TSA was good. The hotel was clean and the staff were helpful. Most of them spoke Spanish, she said, and an assistant manager was Puerto Rican. She couldn’t stay with her cousin, so staying in the hotel was a lifeline. Exterior of the Sleep Inn at the Midway Hotel Center in Bedford Park, Illinois. A standard room at the Sleep Inn at the Midway Hotel Center in Bedford Park, Illinois. Sleep Inn is a three-story tan and ochre building just outside the city limits in Bedford Park, Ill. In the quiet lobby there’s a breakfast area with tables and a small lounge with a sofa and TV. A standard queen room includes a bed, a bathroom with sink and shower, TV and cabinet; some rooms have refrigerators. Most of the housekeeping staff speaks Spanish, says operations supervisor Misty Felton, who confirmed that there are some Puerto Rican families still staying there. Nearby services, however, are scant. There are few restaurants nearby and the closest public transportation is a bus. Twelve miles to the north the Hyatt Centric Loop, by contrast, is a high-rise hotel smack in the middle of Chicago’s bustling downtown business district, on the corner of Monroe and Clark streets. At the end of March this hotel also continued to house Puerto Rican evacuees under the TSA program, and advocates and hotel staff wonder why more evacuees have not been offered the option of staying there. The hotel lobby is spare and modern, with little space to linger, but there’s a French restaurant and luxe-looking hotel bar off the lobby, a guests-only lounge with free coffee, tea and snacks on the third floor, and another cocktail bar on the roof. Across the street is a McDonalds and kitty corner from the hotel is a Walgreens. The hotel is served by multiple bus and subway lines. Sales director Daniel Lewellin said in March that the hotel had 12 rooms set aside for families using TSA, and TSA recipients have stayed there for periods ranging from a few nights to two months. They’ve always had availability, he said, so finding space for more people hasn’t been a problem. Staff have developed relationships with evacuees staying there, mainly elderly couples and single mothers, and even donated winter clothing and other items for them, he said. As of April 29 the Hyatt was not listed in the FEMA database of Illinois hotels participating in the TSA program; Lewellin said that at that time they did not have any rooms available. At the Midway Airport Center, Courtyard Marriott, Sleep Inn and Hilton Garden Inn partnered with FEMA in the fall once TSA opened in Illinois. 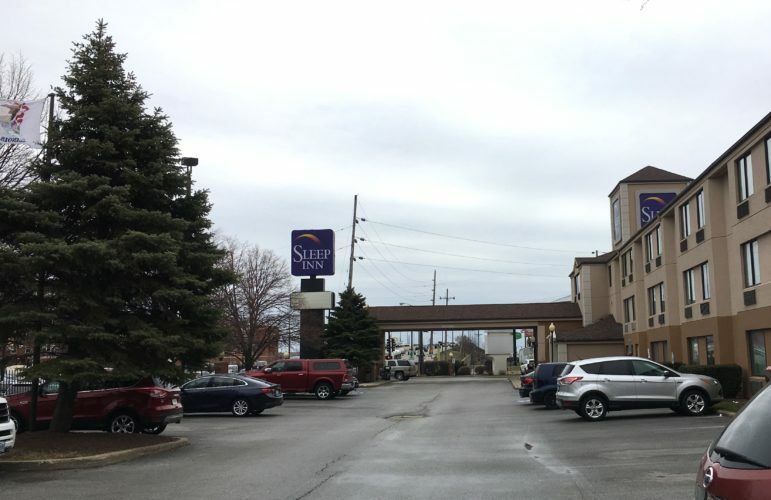 Area sales director Andrew Wells said fewer than 100 people have stayed at those three hotels under TSA and that participants have the choice of which hotel they want to stay in, often switching from one to another within the cluster. Wells also said he is surprised not more people are taking advantage of the program. Alderman Maldonado and Omar Torres-Kortright said FEMA should have recruited more hotels in Chicago to agree to host participants, especially in the weeks right after Maria. “There was no urgency given to it. It’s one of the things that they [FEMA] boast about, that they put people in hotels, but they don’t actually do it,” says Torres-Kortright. Some evacuees returned to the island, despite an uncertain and precarious future there, because they couldn’t find somewhere to stay even temporarily in Chicago. William Cepeda, a Grammy-nominated Latin jazz musician from Puerto Rico, left the island for Chicago soon after Hurricane Maria, before the TSA program was announced. He came to Chicago because he was offered opportunities to perform and teach in the city, but he wound up staying with a cousin in Racine, Wisconsin, 76 miles to the north. He stayed in the region for a little more than a month before becoming so frustrated with his search for housing in, or at least closer to, Chicago that he returned to Puerto Rico. Contributing reporting in Puerto Rico and Chicago by Carla Minet, Hannah Wiley, Gwen Aviles, Isabel S. Dieppa and Jessica Villagomez.